The Tour Divide is a mountain bike race that is 2,745 miles long with more than 200,000 feet of climbing. This is a self-supported race along the Great Divide mountain bike route. The race begins in Banff, Canada and ends in Antelope Wells, New Mexico. The race started June 8 with 105 riders. 10 people have dropped out so far. The leader, Chip Andrus has ridden close to 2,000 miles so far. Andrus is 56 years-old, from Corvallis, Oregon. This is his first attempt at this course. The top riders take under 20 days to complete the course. The winner gets absolutely nothing but bragging rights for winning the world’s longest, most challenging off-pavement cycling time-trial in the world. The challenge is to be ultra-fit and ultra-prepared for anything that turns up. The route is unmarked, so navigation and map reading is a must. 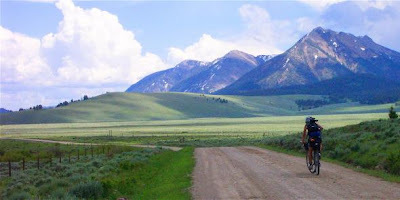 Riders will pass through remote backcountry with Grizzly and Mountain Lion habitats. Food, water, and shelter are up to the riders to carry. There are frequent intervals where more than 100 miles exist between outside services. If the course isn’t difficult enough, 10 of the riders are riding single speed bicycles and two people are riding a tandem. My friend, Mark Barrett, is pulling a single wheel trailer to carry his gear behind his conventional full suspension mountain bike.